Last month, when I posted my i-cord bracelet knitting pattern, I received a couple of requests for a tutorial on the way I was wearing my hair in those pictures, so here it is! I styled my hair in a rope twist that day because I was heading to a party where I knew there would be plenty of pictures taken so I wanted to look nice, but I was also in a hurry so I wanted a hairstyle that I could do quickly. Those two criteria pretty much sum up the rope twist! It's vaguely like french braiding, but it's quicker and easier because you're only working with two strands of hair instead of three. 1. 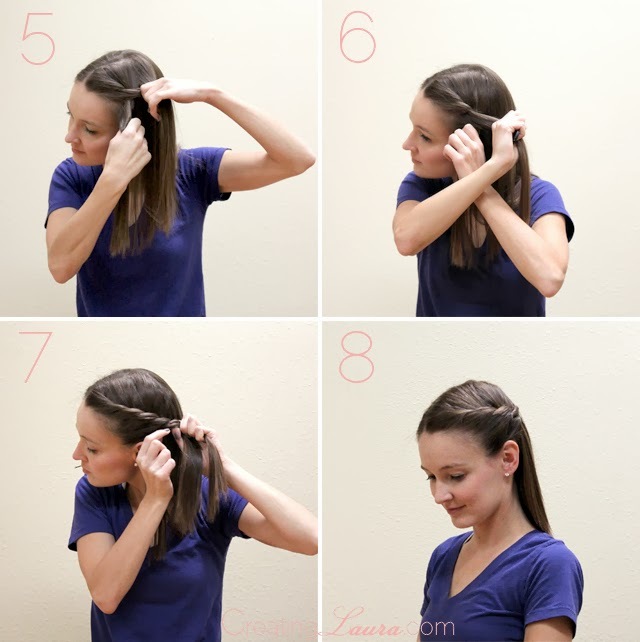 Start with two small strands of hair. Hold one in each hand. 2. Cross your arms. When you do this, you always want the strand of hair that's closest to your face to cross over the strand that's closer to the back of your head. That will make your "rope" twist in the correct direction. Because I'm working with the left side of my hair, I'll always be crossing my right arm over my left arm. 3. 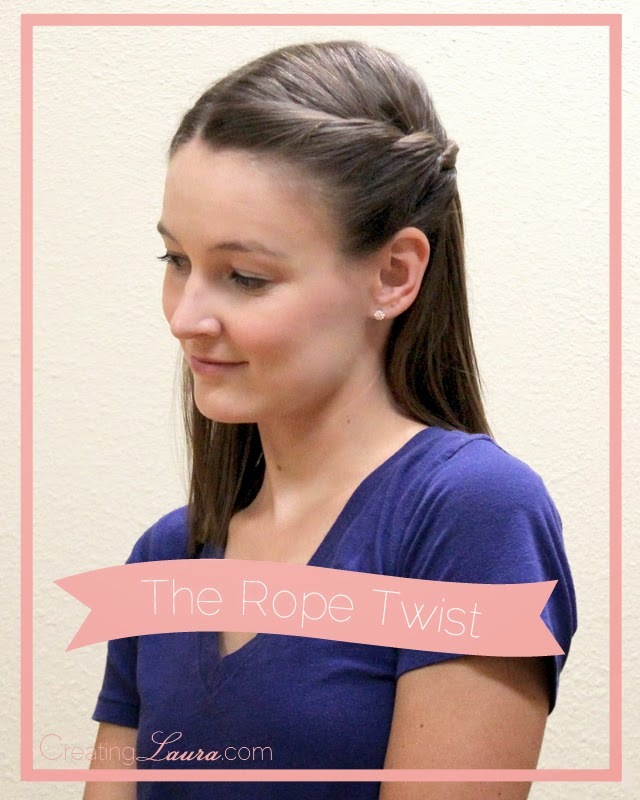 Keeping your hair crossed, switch your hands so they're holding onto the opposite strands and your arms are no longer crossed. 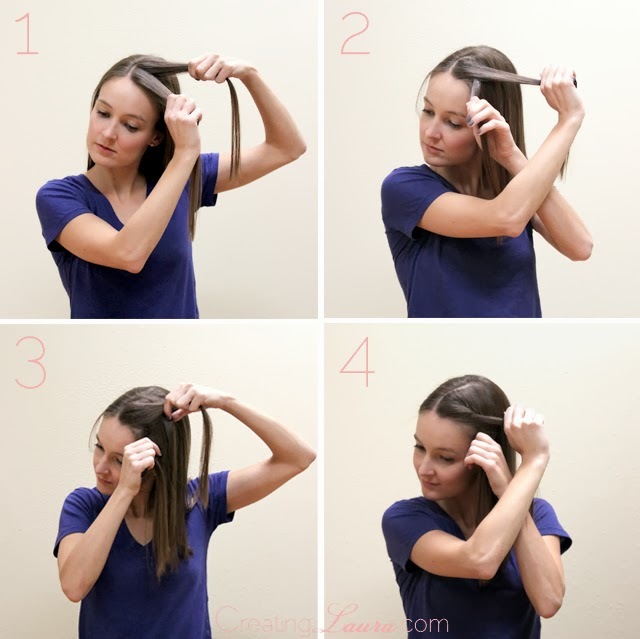 Then add a bit more hair to each strand that you have in your hands. In the third picture, you can see that I'm holding the existing strands in my fists while using my thumb and index finger to pick up the new hair. 4. Cross your arms again. 5 and 6. Continue repeating steps 3 and 4 until your rope is as long as you want it to be. Just keep switching your hands so they're no longer crossed, adding new hair to the existing strands in your hands, and then crossing your arms, over and over again. 8. Shake your head around a little to test that your rope is secure. You're all finished. I hope you find this tutorial useful! I probably wear my hair like this at least once a week in every day life, and almost every day when I'm performing in shows. It's a great way to keep your hair out of your face. P.S. Notice the haircut? My friend, Shawna, cut off about a foot of my hair for me and I donated it to Locks of Love. My hair is my favorite feature and it grows really quickly, so I decided to share the love with a kid in need. 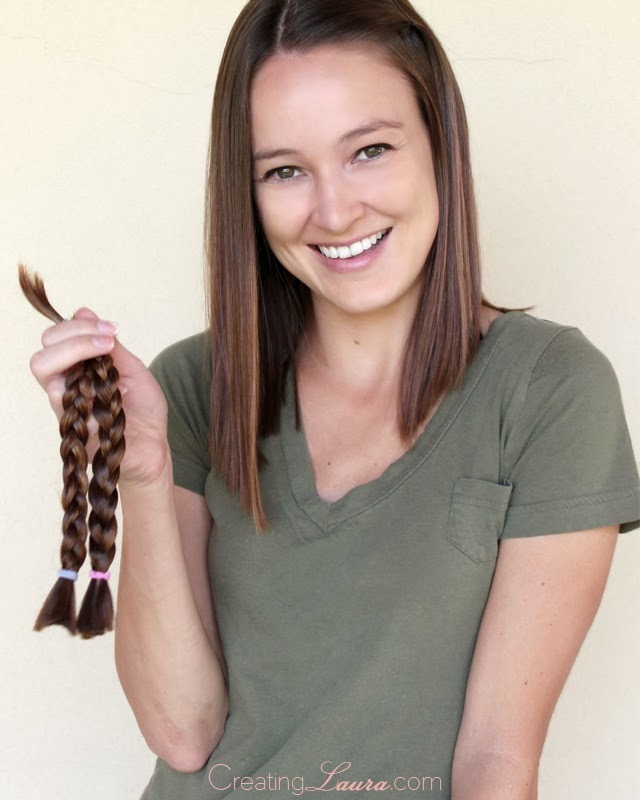 oh my god, that's amazing what you did for Locks of Love ! Thanks! I think they're such a great organization.